To the skeptics of Donald Trump, and I was one of them, he has surely been surprising. Of course, I’m preaching mostly to the choir here, but there is still an ever-shrinking minority within the GOP that remains Never Trump. Why? Is it because of the tariffs? Really? President Bush federalized education policy and increased the unfunded liability to Medicare by trillions with the Part D prescription drug benefit for seniors. No president is perfect. Perfection is what liberals strive for in all their authoritarian glory. Trump has won me over. Frankly, he won me over as soon as he clinched enough delegates to win the GOP nomination. The primary was over. I’m a base voter—and beating Hillary Clinton was the only mission left. Yes, he’s not a conservative. No one cared. He’s a right-leaning populist who has given the conservative wing of the Republican Party almost everything they want: conservative judges, tax reform, rebuilding our military, enforcing border security, taking on Planned Parenthood, and gutting the individual mandate of Obamacare. He did try to repeal it outright. Isn’t this the agenda Republican support and have supported for decades? It’s not the most artful at times, but there is one thing that Trump does that I do love: he fights back. He fights back and gets legislative wins in the process. After nearly a decade of the liberal media operating with impunity, we have a guy who delivers an upper cut to the Democrat-media complex. It’s fantastic. There are some who will never hop on the Trump train, but The Daily Wire’s Ben Shapiro, who didn’t vote for Trump in 2016, said on Bill Maher’s Real Time last Friday that he might back him in 2020. The choice was between Trump and Sen. Kamala Harris (D-CA), who will most likely be a presidential contender at some point. Why is Ben voting for Trump in this scenario? It’s simple: Trump aligns more with him on policy than Harris. Also, he thought Trump wouldn’t have governed as a conservative in 2016. Shapiro admits that wasn’t the case given what has occurred over the past 18 or so months. There are two sides. There are two parties. It’s time to pick one or the other. That doesn’t mean you can’t criticize. Bill Maher bashes Democrats, says they have no guts, and mocks their penchant for political correctness. At the same time, he is definitely going to vote for a Democrat in 2020—baggage and all. Is tribalism bad? It depends. I’d rather we cut through the BS and see each other for who we really are. Both parties have deep, systemic differences on how to govern. The bases of both parties are culturally different. We do have two Americas. There are red states and blue states. The ironic part of the Obama presidency is that for all their attempts to cast that aside and say we are the United States, they did more to highlight those stark differences with their agenda. Shapiro and Maher duked it out over the breakdown of civility and the Russia probe, where the liberal comedian thinks there was collusion, despite an absence of evidence. 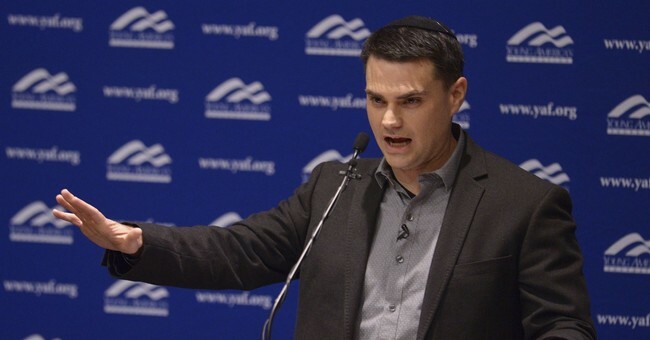 Shapiro admits that he would be open to impeachment if evidence of felonious activity was uncovered during the Russia investigation, or if Trump fires Deputy Attorney General Rod Rosenstein and his replacement fires Special Counsel Robert Mueller. Until then, like any rational human being, Shapiro will wait and see. The larger point here is that two people that are diametrically opposed politically had a conversation that wasn’t marred by the hysteria exhibited by anti-Trump activists. Maher and Shapiro do share the honor of being disinvited from UC Berkeley because their soft student body can’t handle other opinions that deviate from Das Kapital.